I've been away in the muddled east and haven't been able to provide some of the fruits of my digging. 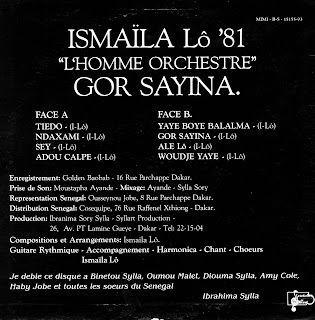 Thanks once more to "op" we get to hear the debut LP Ismael Lo did under the guidance of Ibrahima Sylla. Op warns of a bad pressing but I'm sure the music shines through. Last sighted for sale at Eu125 from afrocubansounds. This is a wonderful album-thanks for another great post! I agree with you Davis, this is amazing stuff. Among his many talents besides singing, painting, writing and acting, Ismael Lo participates in creating an acute awareness of the HIV virus and the havoc it causes in Africa. this is something that we all know is an important factor when buying and supporting the artists around the globe. This man has a story and on top of that; incredible music! 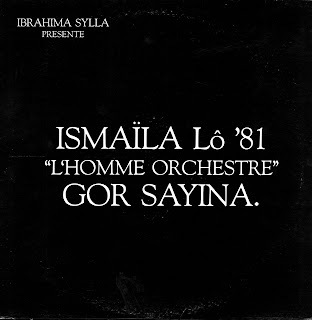 Ismael Lo - FREE Song: 'Diawar'! !